Two surfboards painted by controversial north Devon artist Damien Hirst have sold at auction for £59,000. 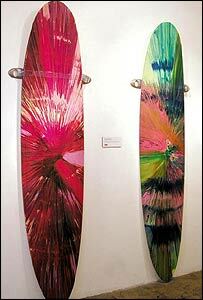 The boards went under the hammer at the Bank House Gallery in UK surf capital, Newquay in Cornwall. They were part of an 11-strong collection of boards painted by artists to raise funds for the campaign group Surfers Against Sewage (SAS) who campaign for cleaner seas. A red-painted board went for £38,000 to an anonymous American bidder over the telephone. The second green board sold for £21,000 to an anonymous bidder in the room. "Bidding for the boards was very brisk and we are delighted with the sale," an auction spokeswoman said. The boards, made by Beachbeat in St Agnes, are able to be used if the owner wants, but as they are now believed to be the most expensive surfboards in the world, it is likely they may not be splashed with sea water. Prior to the auction, the 9ft 1ins long boards already attracted internet bidders from as far afield as the United States, Europe and the Middle East. Hirst, who is a Turner Prize winner, is best known for displaying dead animals in tanks of formaldehyde, but he got involved because his wife Maia Norman is a keen surfer. He said: "It's important that we have someone to fight our corner and lobby for cleaner water as otherwise, between big business and pansy politicians, surfing would be a health hazard." The other boards being sold were painted by graffiti artist Banksy; Jamie Hewlett of the pop band Gorillaz; internationally famous surfer Laird Hamilton; TV star Paul Kaye aka Dennis Pennis; "A"; David Carson; musician Richard D James; Andy Hughes of Surfers Against Sewage and Mickey Boy G of Adrenalin Magazine. The sale of those, together with the Hirst boards, fetched a total of £77,700.